Update: 14-Sep-2006 I've been taken in. This story is factually true, however. Dr. Gold and the other scientists are apparently accurately quoted. And there is speculation that silicon could form the basis for life (although it's a stretch - see this Scientific American article for additional info). It's just that the real source for the story is dated November 12, 1998. This copyrighted story was plagiarized verbatim by whipnet.org, and presented as a current, original story. The true source for this story is here: Alien Life Forms May Be Inside Earth from Times Newspapers Ltd. The tipoff is that Dr. Gold died several years ago. Sorry for the confusion, and thanks to the reader who wrote in to correct the error. 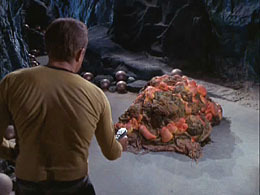 In the classic Star Trek episode The Devil in the Dark, first broadcast in 1967, miners on Janus VI encounter an entity that destroys mining machinery deep in the planet. 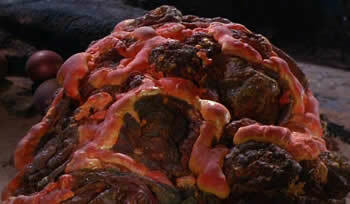 It turns out that the problem is an animal - the Horta is a creature whose metabolism is based on silicon - living rock. Just more of the usual sf nonsense? Dr. Tom Gold, emeritus professor of astronomy at Cornell University, believes that organisms based on silicon may live far below the surface of the Earth. Dr. Gold, a member of the Royal Society, is known as an iconoclastic scientist. He previously predicted that vast amounts of more conventional bacteria live miles down within the Earth's crust. Mainstream scientists were skeptical, but many now agree with him. All known organisms, from bacteria to human beings, are based on carbon; it is an important component of DNA, the basis of life as we know it. Silicon has properties that are similar to carbon; it is in the same group in the Periodic Table. However, silicon atoms are much larger and have difficulty forming double or triple covalent bonds, which are important for biochemical systems. An animal like a Horta, with its ability to tunnel through rock using corrosive acids secreted by its skin, is obviously unlikely. If Gold's silicon-based lifeforms exist, they are most likely to be microorganisms living within the pores of rock deep below the surface. Other scientists are skeptical, but listening. Dr. Harold Klein, who lead the Viking Lander project that looked for signs of life on Mars in the 1970, has urged planners for future Mars missions to include testing apparatus for non-carbon-based lifeforms. "It's almost naive to assume all life must be carbon-based; I could possibly make good cases for life based on both silicon and phosphorus," he said. Science fiction writers have gone out on a limb, scientifically speaking, in writing about extreme life-forms. In his 1957 novel The Black Cloud, astronomer and sf author Fred Hoyle writes about a interstellar dust cloud with intelligence (see the article Magnetic Fields Found To Shape Planetary Nebulae). In his 1959 story Out of the Sun, writer Arthur C. Clarke described living creatures that could live in the sun (see the article Solar Tadpoles Explained By Boffins for more details). Finally, take a look at Intraterrestrial Aliens for more information about silicon-based life.